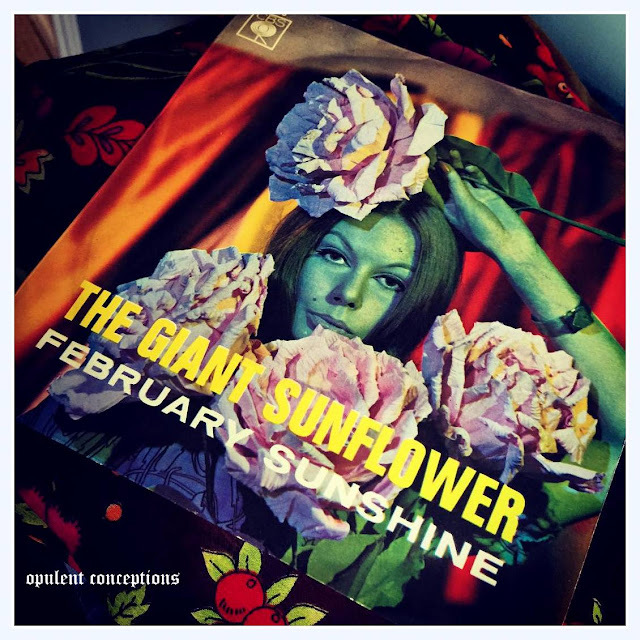 One of the most intriguing releases of 1967 was 'February Sunshine' by The Giant Sunflower. 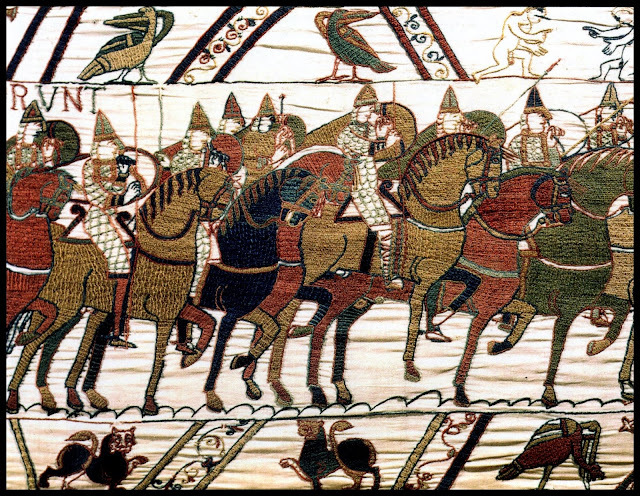 This folk rock song was written by Pat Vegas and Val Garay, two musicians based in Hollywood. The hot new sound in Los Angeles at this time was pleasant laid back sunshine rock with the groups often fronted by a good lookin' flower chick with long hair and love beads. 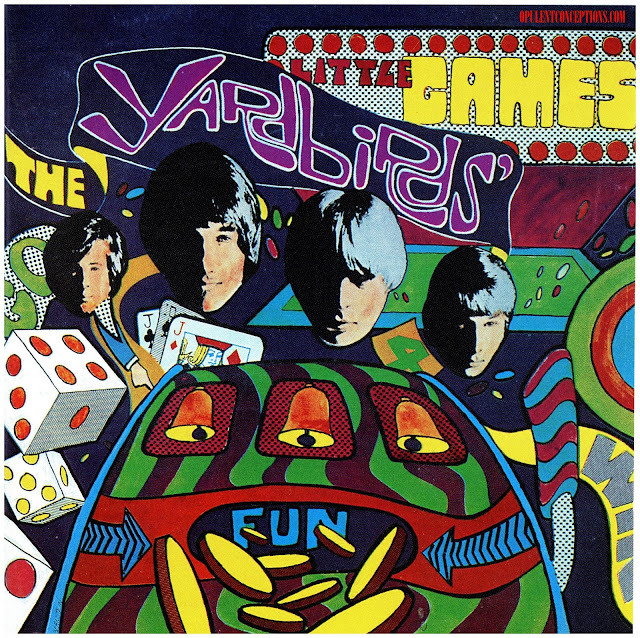 'February Sunshine' has that pure L.A. sunshine sound and is just perfect '67 fodder for the radio. 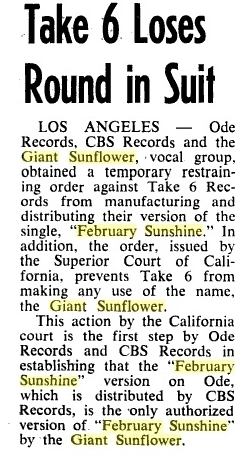 The song was recorded by studio musicians and released on Take 6 Inc with the non-existent group name of The Giant Sunflower. The recording was quickly snapped up by Lou Adler's Ode label who got the song re-recorded. Out of interest The Rose Garden also recorded 'February Sunshine' at Gold Star Studios, Hollywood and their version can be found on their album. The new recording of 'February Sunshine' was then released on Ode in USA. 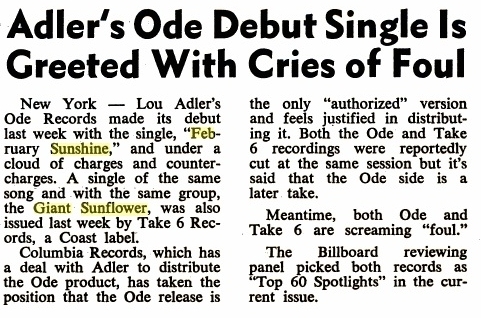 Lou Adler had a deal with Columbia Records to distribute his Ode product in other countries around the world. 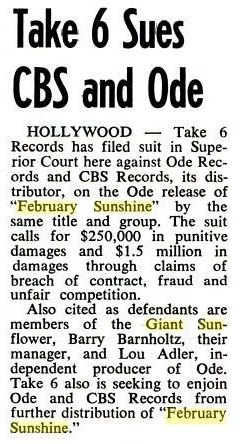 John Noreen from The Blokes/The Rose Garden confirms that Charlie Greene and Brian Stone, who were managing Sonny & Cher, became involved with his group and got them the deal to act as The Giant Sunflower for promotional purposes and the odd gig because the record was receiving lots of airplay and Ode needed a group to go with the record. 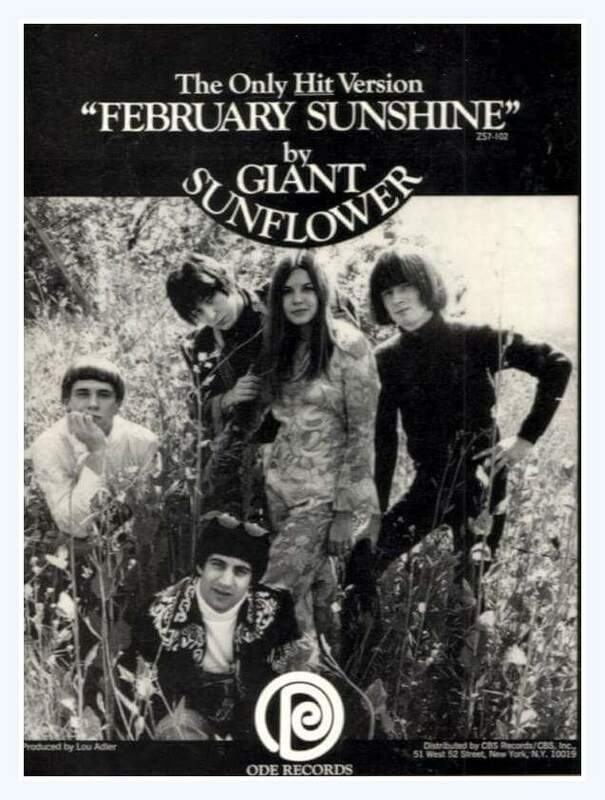 *** to add to a confusing and somewhat conflicting story, Patti Phillips aka Margo left a message on the old G45 Central site stating that she was a member of the original Giant Sunflower along with Val Garay, Terry Clements, Eddie Hoh and Rick Dey. The latter was previously a member of The Wilde Knights and wrote 'Just Like Me' which was recorded by Paul Revere and the Raiders who had a huge hit with it. 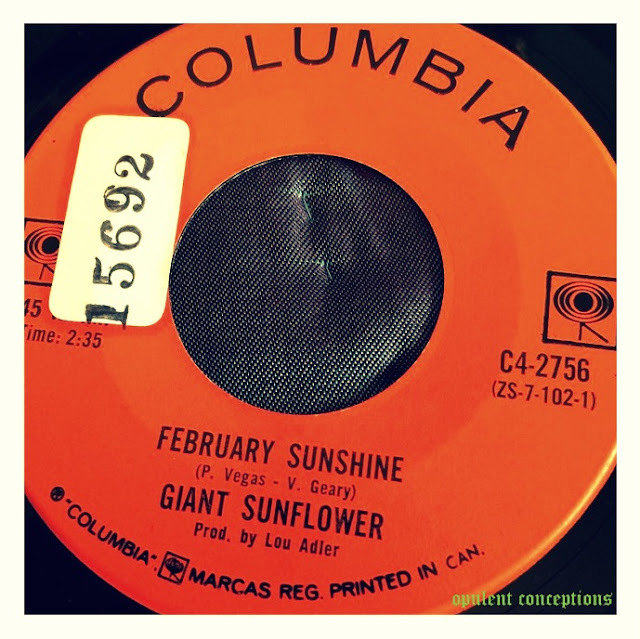 During the month of July 2015 I was in contact with Margo Phillips via email who kindly sent me information about The Giant Sunflower as well as some clippings published in a teen magazine during 1967. The Giant Sunflower was a real band and we performed live. Val Garay (who co-wrote February Sunshine with Pat Vega) put the band together. Val (rhythm guitar, vocals), Terry Clements (lead guitar, vocals) me (vocals), Eddie Hoh (drums) & Ric Dey (bass). Eddie was also the drummer for The Mamas & Papas at the same time. I think that's how we ended up at Lou Adler ' s house to audition. Lou was sitting on his couch with two of The Mamas & Papas--Denny & Cass. Val, Terry and I sat on the floor and sang a song or two. Lou decided to produce us and signed the band (all five of us) to his new label, Ode Records, part of the Columbia Records conglomerate. We performed often at The Whisky (a Go Go) on the Sunset Strip in Hollywood. Lou was co-owner of the club (with Elmer Valentine) so he booked us there as the opening act for Van Morrison & Them, Eric Burden & The Animals, Steppenwolf. We also did a concert with The Buffalo Springfield. We were the opening act, followed by The Moby Grape and then The Springfield. 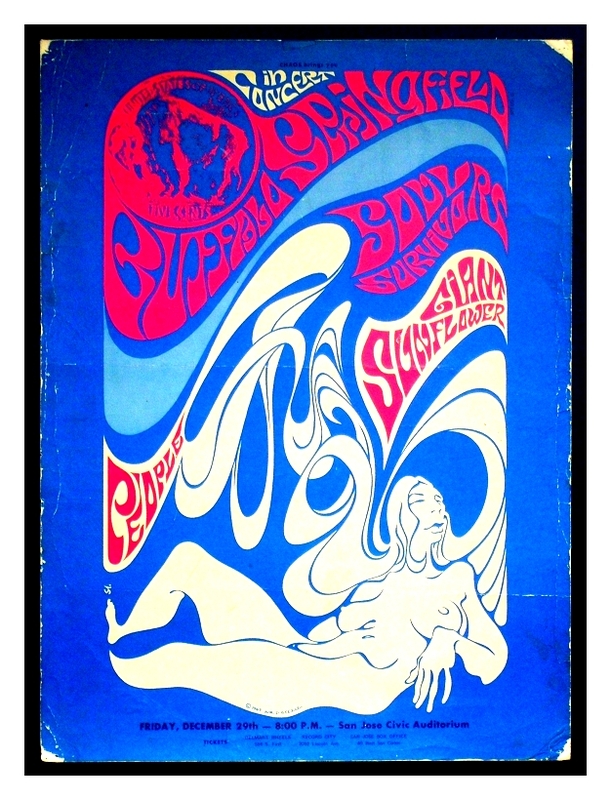 concert poster for Buffalo Springfield (featuring Neil Young and Stephen Stills) appearing with the Soul Survivors (Expressway to Your Heart), People and Giant Sunflower at the San Jose (CA) Civic Auditorium on 29th December 1967. 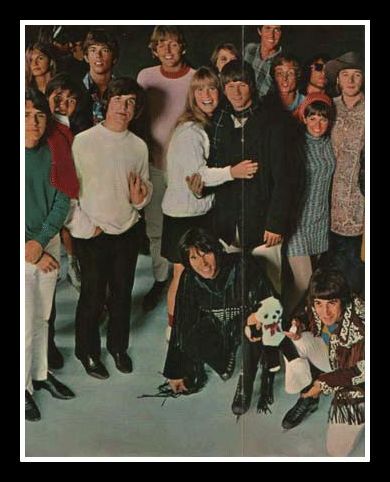 We performed at some sort of festival on the Santa Monica Pier with The Turtles, Jose Feliciano, The Leaves or The Grass Roots and The Association (I think they were there) and other bands I don't recall (Val would know). So don't quote me on that line-up! Anyway, all this to say, no, we were NOT a studio band. I think I may know how that was misconstrued. 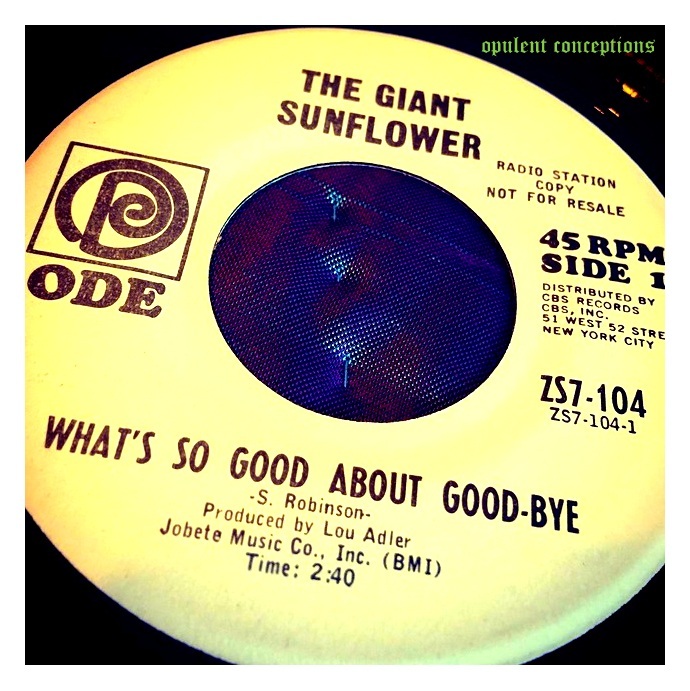 Lou Adler DID use the hottest studio musicians on both our singles--February Sunshine and What's So Good About Goodbye . They were known as part of the "A-List" called The Wrecking Crew. We (The Giant Sunflower) were in the studio for all the sessions but Lou only let Terry Clements play with these guys. Val, Terry and I did ALL the vocals. Your blog got it right about the lawsuit. It killed our first single, February Sunshine--which was on it's way up the charts. 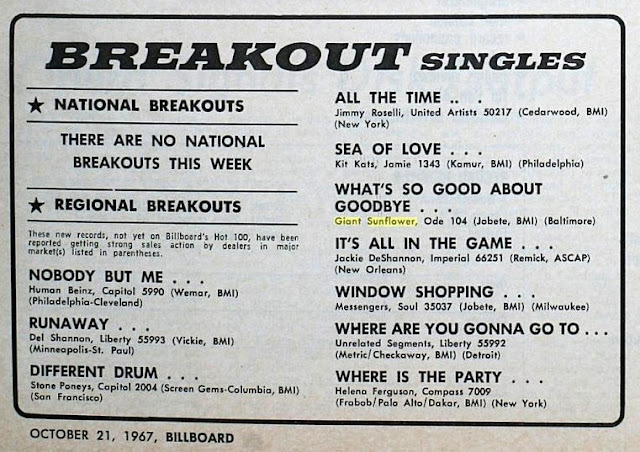 Our second single, What's So Good About Goodbye, didn't have the same promotional "steam" behind it. My guess is that I think Columbia lost its enthusiasm about our band after the million dollar lawsuit. They didn't need the legal problems from a brand-new group that hadn't made them any big money yet. Again, Val Garay may have more info on this. So, that should set some of the story straight. I can go into the band break up. As for how The Rose Garden took over our band's name and went out performing February Sunshine-- I have no idea. I joined a Buddhist group (cult?) during that time and disappeared from the music scene. (I did get "accidentally" signed to Warner Bros. in 1980s as a solo artist under my married name, Patti Fisher. 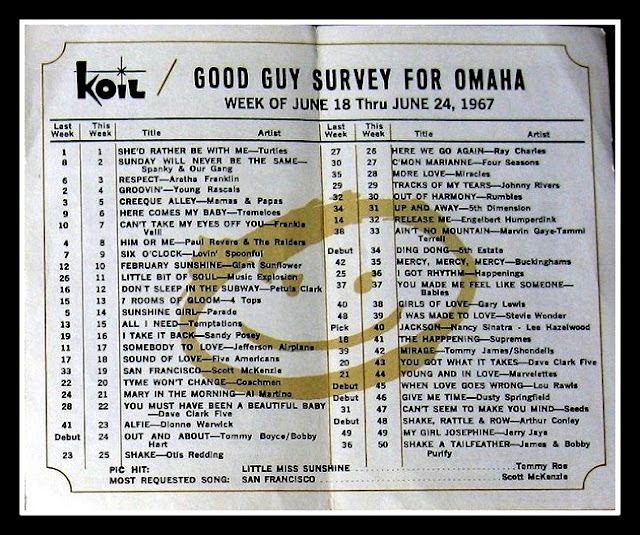 That single was also destined to be a hit but also killed by dirty music biz politics. Obviously, it was not my fate to be famous and ironically, I never wanted to be. But music is in my blood and in my soul and I was blessed with many experiences with some most excellent musicians. Anyway, I hope you enjoyed the music trivia! "February Sunshine" can be found on 'Highs In The Mid Sixties - Volume 3' - a vinyl comp of 60s recordings from Los Angeles released in the early 80s. left to right, standing--Eddie Hoh, Patti Phillips (Aka Margo), Terry Clements, Rick Dey. Sitting -- Val Garay. 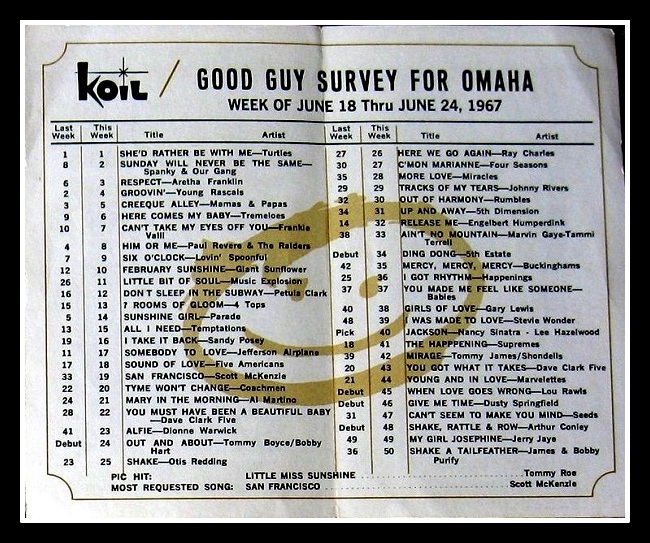 During May 1967, Billboard printed three articles about the conflicting interest between the labels Take 6 and Ode Records which make for fascinating reading. 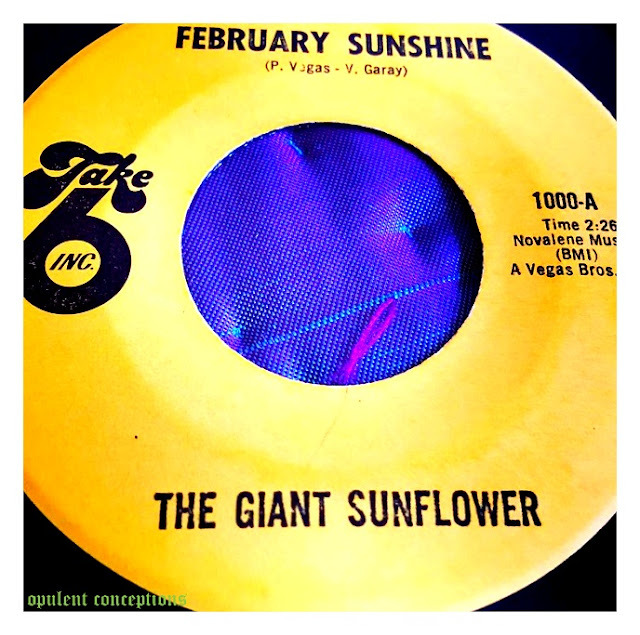 A follow up 45 by The Giant Sunflower was released some months later in October 1967 and again the record perfectly demonstrated the flower power, sunshine pop moves that Los Angeles was increasingly becoming known for. 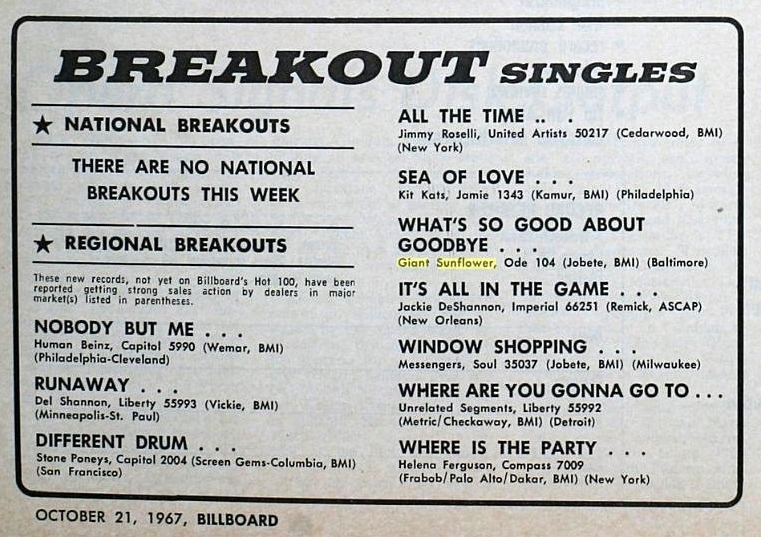 The record got a mention in Billboard but despite the groovy sound appears to have had little or no impact on the charts. Nice bright and breezy record, the Giant Sunflower version is superior to the Rose Garden version to these ears. Thanks for the fascinating story to read while I play and re-play this swell record. i dig this song so much ....however i really dig a different take of this better ...it's from pebbles presents: highs in the mid sixties LA 67 vol 2 ...it's a little slower and has some b/u vox that make it a little more groovy but this version is cool too thanks for posting it ! This is great. Thanks for posting it. It turns out I was in the band that recorded this song. The version where Barry Barnholz was the Manager. He brought the name of the band and the song and asked my band if we would record it with him. It became number 3 in less than a week and then the law suite stopped everything. Thanks for dropping by sven and adding your comments. I was in the actual real & original Giant Sunflower. Val Garay put it together. Val, rhythm guitar , Terry Clements (lead guitar), Rick Dey (bass) & Eddie Hoh (drums). I just wrote a long piece here & it didn't post. I'll be glad to fill in more details later but I'm not re-writing it all again now. Stay tuned... Margo Phillips (aka Patti Phillips) PS Val just posted the official promo photo of The Giant Sunflower on my Facebook page. You can check it out there. I'd love to know more about The Giant Sunflower. 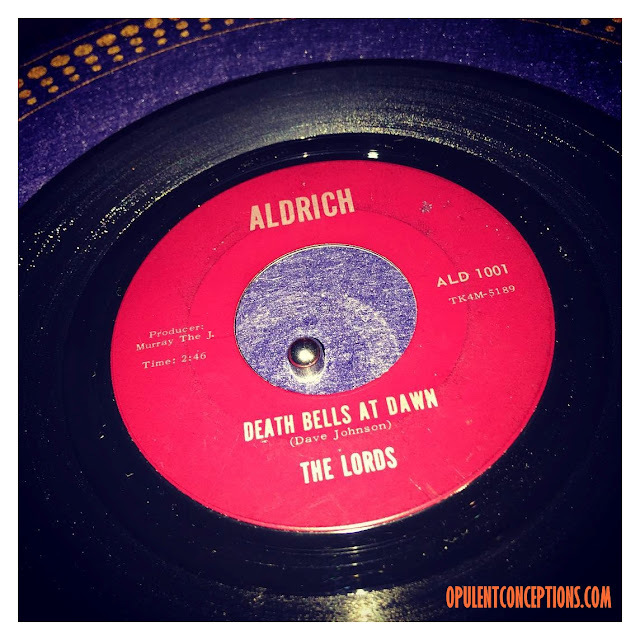 I've been intrigued by the group for some time, eventually tracking down the 45s. Not easy as I live in England but thankfully eBay helped! If you'd like to fill in more blanks please email me. contact details below.